McGregor vs. ‘Cowboy’: Why the Hell Not? 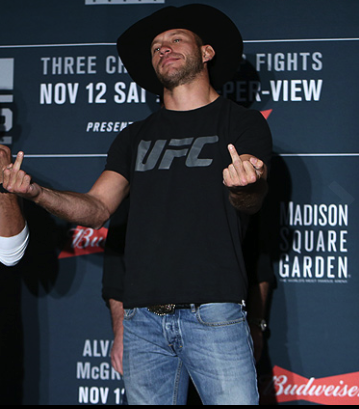 It’s incredible to think that just a few short months ago, Donald Cerrone’s career looked like it was nearing an unceremonious end. Four losses in five fights — two of them via TKO — said that Cowboy’s days as a top-5 guy were over, and a generation of dangerous contenders climbing up the welterweight ranks dictated that the fall from grace would only get more precipitous as time went on. When he got matched up opposite Mike Perry, the 27 year-old power-punching eccentric the Ultimate Fighting Championship has been intent on pushing since his explosive debut back in 2016, it felt like they were angling for a changing of the guard. The fact that “Platinum” happened to be moving in on Cerrone’s digs as a member of Jackson-Wink MMA, leading to an embittered and public family feud that saw “Cowboy” estranged from the camp he helped build, made his potential demotion to gatekeeper status seem even more ruinous.